While the Treadwall from Brewer’s Ledge is no Lil’ Minx, it is one of the coolest pieces of equipment I’ve stumbled upon lately. The Treadwall lets you rock climb where no rocks be found, like at the gym or in the backyard—you know, in case you don’t live by any insanely craggy rocks. 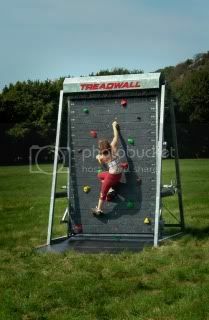 Just like infinity swimming pools let you swim against the current until you’re exhausted, the Treadwall is a rotating wall that lets you safely rock climb until you can hold on no more. Available in a number of styles—free standing or wall mounted, with adjustable or fixed angle—it’s also available in different sizes to suit the user’s needs. The wall uses gravity and hydraulic controls to rotate, and there is an automatic stop sensor and speed control so climbers can pause on the wall when needed and adjust the rate that the wall moves. Users can adjust the angle of the wall depending on the challenge needed, from a gentle beginner-friendly slope to a muscle-burning overhang. The holds can be moved, changed and re-oriented at any time so you’re not climbing the same fake mountain all the time. No ropes or harnesses are needed because there is nowhere for clumsies like me to fall. You stay at a height of about two feet, so young’uns and old’uns alike can feel comfortable using the equipment. Also beneficial if you’re terrified of heights. Looking to try something new? Check out my first time in a boxing class or my tough kettlebell workout. the treadwall is my FAVEFAVE. if I could own one Id be such a happppy Miz. This would be so incredibly awesome to own, but I can’t imagine how much they cost! I just checked out the website and they don’t even have the price listed–that’s not a good sign! I wonder if that would fit in my bedroom. 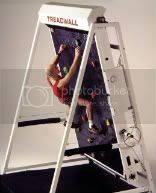 They have one of these at my climbing gym…cool but doesn’t give you that rush sensation of ‘if you fall, you die’ when you’re harnessed 50 ft. in the air. If you’ve never been to a climbing gym – I highly recommend especially if you have a fear of heights! Holy wowsa – the treadwall looks insanely cool! Awesome! Have a fantastic Tday! I gotta get one of these! Or at least convince my gym to invest in one!